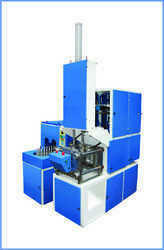 Prominent & Leading Manufacturer from Delhi, we offer semi automatic pet machine. Owing to our wide expertise in this field, we are involved in manufacturing and exporting the qualitative range of Semi Automatic PET Machine. Due to their efficient production rate with excellently finished products, these are widely used for blowing pet bottles in various bottling plants. Our utilization of premium quality materials and innovative technology has enabled us to make wide specifications of these machines as per clients' needs. Looking for “Semi Automatic Pet Machine”?